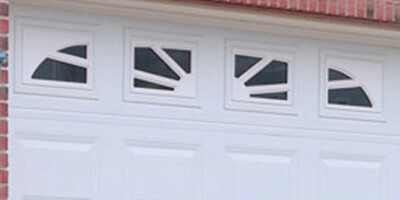 Garage Door Windows & Glass | CW Garage Door Distribution LLC. CW Garage Door can add a touch of elegance to the outside of your home with the addition of decorative garage door window and glass options from CHI Overhead Doors. Their window and glass options are designed to enhance the natural beauty of your exterior while adding to the value of your home. C.H.I. Overhead Doors’ patented screw together frames are designed for years of worry free weather protection. C.H.I. Overhead Doors also offers seven window insert designs that add distinction to any home. Window Frames and Inserts are U.V. protected and are available in all door colors. The inserts can also be painted to match existing trim colors on your home. 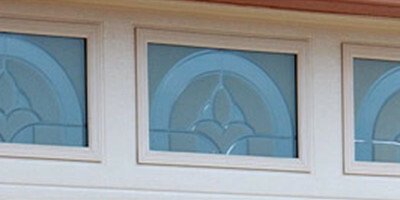 Standard windows begin with an 1/8” single pane non-insulated version. The Hawthorne and Somerset acrylic windows offer homeowners added durability while maintaining the elegant look of actual beveled glass. CW Garage Door's new designer window options include the Hampton, Temple, Imperial, Florence and LaSalle series. Contact CW Garage Door today for more information on any of these windows or to find out what other options are available.